I had really gone off Studio Ghibli films in the last decade and a half. Despite all the awards and critical acclaim, “Spirited Away” didn’t really leave much of an impression on me at all. Since that film very little of their output has wowed me. But I did think “Ponyo on the Cliff by the Sea” was a great film as well as “The Cat Who Returned a Favour”. The other films since 2001, I could take or leave. I’ve even stopped buying the films as they came out on home video in Japan. I only bought the last two films a month ago when I was in Japan. I didn’t think my view of the studio or their films would change until I saw this documentary. Mami Sunada, whose only previous film was the documentary “Ending Note” (subtitled “Death of a Japanese Salaryman” in English), went to Studio Ghibli just about every day from autumn 2012 to September 2013 when Miyazaki announced his retirement. The film follows the production of Hayao Miyazaki's “The Wind Rises” and Isao Takahata’s “The Tale of Princess Kaguya”, both due to be released on 20 July 2013. Already by autumn 2012, things are going really badly with Takahata’s film. Only 81 cuts (of animation) have been completed. The producer of the film, Yoshiaki Nishimura, has been working on the film since at least 2006 and is finding it near impossible to crack the whip in order to get Takahata moving along. Because Miyazaki is working at the main studio in Higashi-Koganei and Takahata at a second studio miles away, Sunada focuses almost entirely on Miyazaki and his film. Apart from those directly working on Miyazaki’s film (Other than Miyazaki, the main focus is on his giggly production manager known affectionately as Sankichi), Sunada also focuses on producer Toshio Suzuki, who essentially runs the financial and business side of the studio and seems to be forever in meetings with third parties. To be honest the lack of Takahata's presence doesn’t really matter. A fair chunk of the movie does deal with this side of the studio. Suzuki is seen dealing with publishers, merchandise sales and the promotion of their two upcoming films. The business side of the company is centred at the main studio at Higashi-Koganei, so it makes sense that Sunada would focus her film there. But as you imagine the majority of the film deals with Miyazaki’s struggle with his film; he has trouble completing the storyboards, he wonders out loud to Sunada what kind of film he is making, he has trouble finding a suitable actor to fill the lead role of Jiro etc. Sunada shows his daily routine at the studio and his working relationship with Sankichi whom he seems to adore, and even anointed her wedding. However we also hear form several of the key animators who say they like to keep their distance from him and more troublingly that several really talented staff quit due to the fact they couldn’t work with him. While Miyazaki can be rather jovial and happy, many of the times he talks to Sunada he’s quite pessimistic. It seems that that the 2008 financial crisis and the 2011 Tohoku earthquake and tsunami have led him to believe the future won’t be bright. Regardless he also says that he feels hope for the future due to children. Studio Ghibli even has an in-house child care centre. Suzuki’s various troubles during the production of the films seem to get worse as the documentary progresses. He wonders what he should say at the press conference in regards to Takata’s film. Later he concedes that there is no hope the film will make its 20 July release date. Later in the film he seems to be a mediator between Goro Miyazaki and his producer over an argument regarding his next project. Goro doesn’t come off well in this segment. It feels as he’s being really difficult as he explains he never wanted to be a director. Though Suzuki tries to convince him he is doing the right thing, by the end of this section of the film you can see that Suzuki has had enough. He’s literally slumped over the table exhausted as Goro’s producer continues to try to negotiate with Goro. The largely absent Takahata (who appears on camera for less than two minutes some 15 minutes before the end of the film), is the main source of frustration for Suzuki and Miyazaki for a great deal of the film. Both don’t believe he’ll finish his film. “It’s almost like he’s trying not to finish” says Miyazaki. The strange thing is that Miyazaki does seem to hold a lot of respect for Takahata, but in the next breath will run him down and criticise him. At one point he recalls a time where he came back to the studio after “My Neighbours the Yamadas” had been finished, and the studio was in a complete mess due to the way Takahata ran it. All the while he seems to be smiling while telling the story, as if it’s a pleasant memory. He later tells Sunada that he has abandoned Takahata as a film maker, though she retorts by saying “Isn’t he making a film now?”. Takahata and Miyazaki’s working relationship is complicated further when we are told via archival footage and photographs that Takahata discovered Miyazaki, but Miyazaki overtook him in terms of talent and popularity. The other main player in this documentary is Evangelion director Hideaki Anno. He first gets involved when Miyazaki and Suzuki decide that he should voice Jiro in the film. After a hilariously awkward audition, shockingly both of them give him the part. Anno animated the God Warrior segments in Miyazaki’s 1984 film “Nausicaä of the Valley of the Wind”. The pair have been friends since. Anno’s appearances in the documentary make him come off as really awkward, mostly the times he tries to voice Jiro. When Sunada asks Miyazaki what thought of him when he first met him, he says he felt he was like an alien. Later Miyazaki quips that Anno is fun to bully. In what is probably one of the funniest scenes of the film, Miyazaki complains about Mitsubishi Zero otaku. Sunada asks Miyazaki if he is an otaku. He says no, but after that Sunada edits in a scene where Anno and Miyazaki are playing with a model Zero aircraft in a meeting with Suzuki. It has been suggested by some reviewers that Sunada is a bit of a “fangirl”, but there really is no evidence of that in the film. As I described in the last paragraph she isn’t above making a little fun of her subject. There has also been criticism of the lack of Ghibli film footage from their back catalogue. But the film isn’t about the animation itself, it’s about the studio and the people in it. The only time we see any of footage Miyazaki’s films is just before he is due to go into a press conference about his retirement, when he calls over Sunada and explains why he likes animation so much. Sunada filmed and directed the documentary herself. It really looks fantastic. She focuses on little details and frames everything so beautifully. Having been to the area where Studio Ghibli is, it is a gorgeous suburb, so she really didn’t have to work too hard to make the film look great. Sunada also focuses on the studios’ cat Ushiko and uses footage of her to link scenes together. The DVD and BD versions also have an extra feature called “Ushiko Saw It”, which is pretty much a bunch of outtakes centreing on Suzuki. Overall it’s a fantastic documentary. Sunada seems to have an uncanny ability to choose this time period of the studio’s life to make the documentary. It does explain why some of the casting and story decisions were taken with “The Wind Rises”. However the film does make me a bit sad. Studio Ghibli doesn’t need to close down, however Miyazaki seems determined it will. There’s also Miyazaki’s determination to make another film after the completion of “The Wind Rises”, which seems to have completely evaporated in the final section of the film when he announces he retirement. 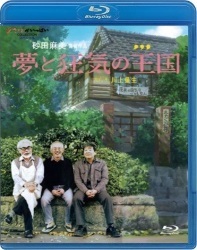 Despite the west’s love affair with Miyazaki films, the only English language version of the documentary on blu-ray is the Japanese version, which has no English subs on the extras. You really have to wonder why that is. Apparently the US DVD of this film is already out of print which is baffling. I’ll give this film 8 out of 10. Remaining Backlog: Six series, 13 movies, two OVAs also waiting for second parts for two shows to be released before viewing them.